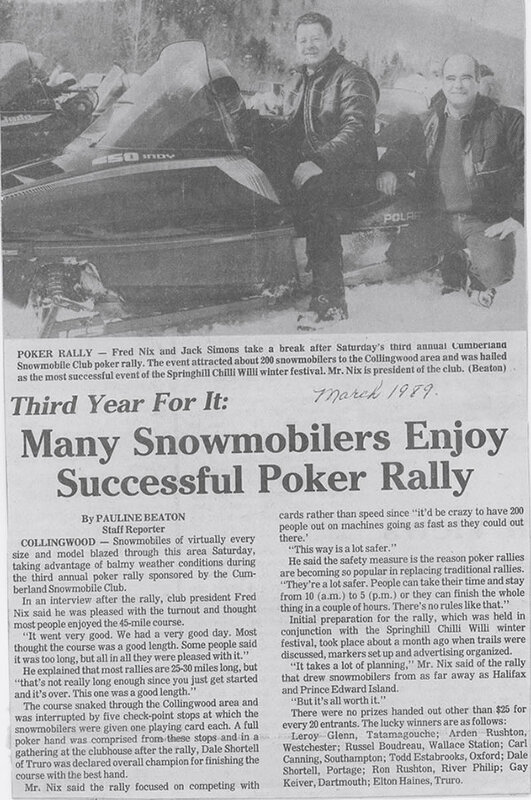 The first meeting of the Cumberland Snowmobile Club was held on February 11, 1968 with 19 members present at the home of Chesley Walsh Senior. Dues were $5 a family and the Boy Scout camp at Simpson Lake was used as a clubhouse. 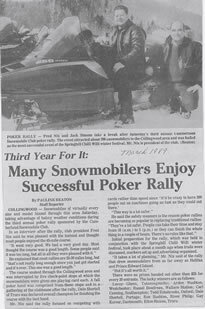 During the 1970/1971 season the annual dues were raised to $6 with the extra money going to the newly founded Nova Scotia Snowmobile Association (NSSA). In 1973, the clubhouse moved to its current location, with the land being purchased from Raymond Austin for $100 and the clubhouse built by Bragg for $100. 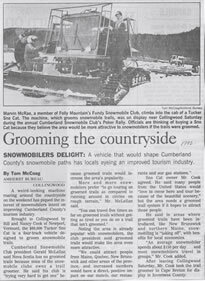 In 1973 dues increased to $10 a year and $5 a year every year thereafter in order to finance an Alpine Groomer costing $2711.38. Trail grooming could begin! In the 70’s there was an emphasis on “race weekends” held at many local lakes such as Simpson and Melody Lake and it was a great opportunity for fundraising. In fact, there was a “racing committee” struck to organize such events. In the club minutes it was decided that the prices for hamburgers would be 35 cents, and coffee and tea would be sold for 10 cents a cup. During these special race weekends, invitations would be sent to the other local clubs (such as the Driftclimbers) to attend and their members would be generously housed with our club members. What snowmobiling camaraderie! In the 70’s the major topics of discussion at the meetings revolved around the dances, socials, races and the lunches at the meetings. There was a dance every month at the snowmobile club as a fundraiser. During the 80’s, although the focus of the club was still very social, trail work, improved signage and the purchasing of safety equipment made up the majority of the work of the members. Signs were erected in an effort to keep people off the blueberry fields. Some things never change! Monthly bulletins were printed and distributed to keep everyone up to date. Liquor and refreshments were sold at the club – ah, the good old days! A day was set aside for trail work in the fall of the year when all club members came out to lend a hand. Rallies were called “Snow-aramas” and they consisted of a 40 mile route that members would gather pledges for. Half the proceeds would go to charity and the other half to the club. Sunday afternoon “Safaris” were popular with a start time of 1:30 p.m. and members would gather and travel single file led by a knowledgeable club officer. At this time, the machines were still not too reliable so it was probably a safe way to travel and enjoy the trails. The year 1990 was busy for our club. Our “Memorandum of Association” was struck and our by-laws finalized, legitimizing the work of the club and making things more official. A Bombardier groomer was purchased for $5930. The clubhouse was expanded to include an annex, a bathroom, a kitchen addition and new bridges were put in place outside. We finally got up to 100 dues-paying members in good standing. The groomer and trail development account was opened. 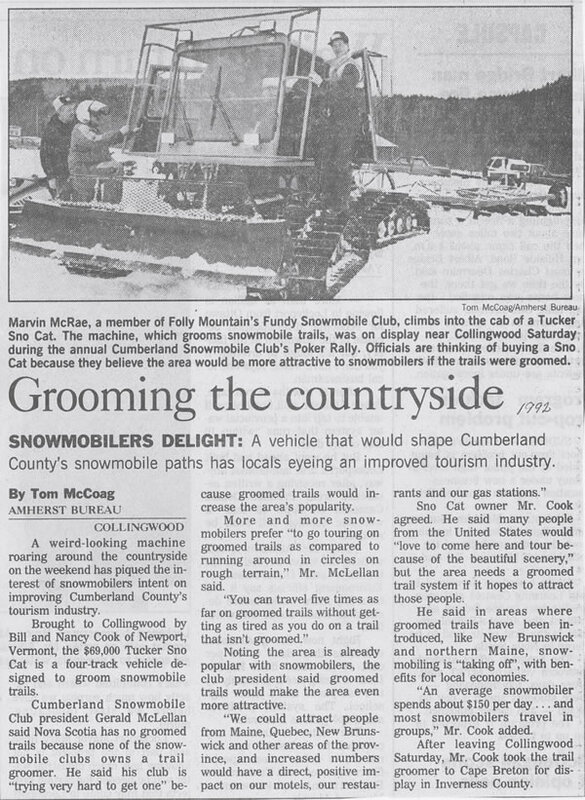 In 1991 the Cumberland Snowmobile Club won “Club of the Year” in Nova Scotia. The “environment” is first mentioned in the club minutes in regards to conservation. In 1994 we bought a Bombardier groomer for $68,860 and many of our members made substantial personal donations to help fund this purchase. In 1995 we finalized an agreement of cooperation with the Chisholm Club. We installed a gas tank and began selling gas for 80 cents per litre in the winter of 1996. We purchased a second Bombardier groomer in 1998 to be run out of the Amherst area. We purchased our John Deere Gilbert groomer for Collingwood in early 2002 for $126,500 thanks to donations, pledges, bond sales and a lot of fundraising and the Bombardier was relocated to the Amherst area. In 2008, the Bombardier was replaced with a 1998 Tucker Sno-Cat that handles all trails on the north side of the Trans Canada Highway from Amherst and recently toward Oxford. Our efforts at the club continue with a recent focus on securing government grant money for trail directional signage, trail infrastructure repairs and maintenance (such as the installation of culverts and re-decking of bridges).